Payroll Giving is a flexible scheme which allows anyone who pays UK income tax to give regularly and on a tax-free basis to Pancreatic Cancer Action. Every time you get paid you can help those affected by pancreatic cancer. Payroll Giving donations are deducted before tax so each £1 you give will only cost you 80p and, if you’re a higher rate tax payer it will only cost you 60p. Payroll Giving is completely unique to you as there is no upper or lower limit on the amount you can give. It is an easy, valuable, long term way to donate that can be taken straight from your payslip. You are not tied into a contract so you can stop payroll giving at any time if you wish to. You will receive tax-relief so you will be giving more money to the charity at no extra cost to you. 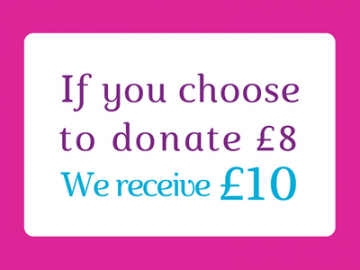 For example, if you chose to donate £4 we will receive £5, if you chose to donate £8, then we will receive £10! What are the benefits over just donating? If you would like to find out about other ways you can fundraise for Pancreatic Cancer Action please visit our page ‘How to Raise Money for Pancreatic Cancer Action‘.